Last night I was camped beside Loch Einich in the Cairngorms after a walk over Sgoran Dubh Mor and Sgor Gaoith with ultralight backpacker Colin Ibbotson (more on this in a future post). The day had been sunny and clear with just a cool southerly breeze. The forecast was for increasing wind and rain. We thought our camp on the west side of the loch was reasonably sheltered but early in the morning I was woken by great gusts of wind roaring down the glen and rattling the tent with splatters of rain. Curious to see how Colin’s tarp was performing in the storm I unzipped the door and peered out into the near darkness. Immediately a glow in the sky to the north caught my attention. Surging masses of clouds swirled over the head of the loch, shredded and torn by the wind. Away in the east the sun was rising and its first rays shone under the edges of the clouds and lit them from below, turning them pink and orange. As the clouds swirled and merged and split apart the light changed constantly, the patches of colour expanding and contracting, an amazing vast light show encompassing much of the sky. Suddenly wide awake I grabbed the camera and started taking photographs, using the tent porch as cover from the rain. For ten minutes the magical light continued then the colours began to drain away and the sky darken and turn grey. The following day was dull and overcast with rain showers. Walking out of the mountains down Gleann Einich I didn’t take a single photograph but it didn’t matter. The stormy grandeur of the dawn still shone in my mind. 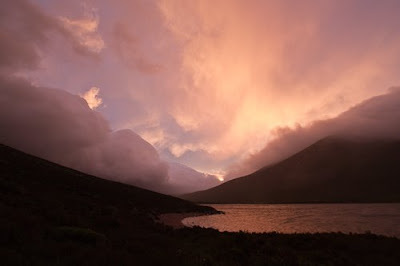 Photo info: Dawn light in storm over Loch Einich. 4.50a.m. Canon 450D, Tamron 11-18mm lens@11mm, 1/160@f5.6, ISO 400, raw file converted to JPEG in Lightroom 2. Stunning photo Chris. I would have a bet that tarp was fine as Colin built it to cope with UK weather and the TGO Challenge? You only get to see mountain views and light shows like that by staying out in the hills. The joy of backpacking. but how was the tarp? Fantastic, it's a privelage to witness nature putting on a show when you are out in the wilds. How was the tarp doing by the way? Fascinated to see how you got on with Ibbo! Wonderful! We had a glorious sunset over Loch Morlich on Saturday (several of my Dusk Walk customers commented on it (I'm Forest Ranger at Glenmore campsite)), but no glorious sunrise on Sunday - unless I slept through it! Thanks for the comments everyone. The tarp was fine - less noisy than my tent. There was only a touch of pink at sunset. The ten minutes of spectacular dawn light was around 4.50 so you needed to be up early to see it! Great photo Chris, interestingly I was camped in Norway the same night and I also had a similar experience with the light, a definite pink/orange glow in the clouds.